Is the law improving student performance? More than three years have passed since President Bush signed the No Child Left Behind Act. 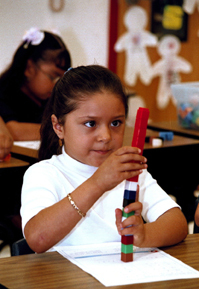 The controversial legislation mandates “highly qualified” teachers in every classroom and holds schools that accept federal funds accountable for raising the achievement of all students, particularly those with disabilities, those from low-income families and racial and ethnic minorities and those with limited English proficiency. Supporters call the law an evolutionary change in education policy while critics call it a revolutionary federal incursion into states' historic domain that makes too many unfunded demands. Eight school districts and the nation's largest teachers' union have sued the Department of Education over the law's funding provisions, and legislators in several states have introduced bills seeking exemptions from the law. Supporters, meanwhile, worry that No Child Left Behind is not being enforced stringently enough and is in danger of being diluted.